Here is a clip of a sheep getting clipped. I have seen this before on TV, but seeing it live is something else. Enjoy. Our place is like a construction zone. We hit three different Ikeas in three days, got a lot of stuff. For the past few days, I have been building the furniture kits. I am still not done. Anyway, have a happy new year...blah, blah, blah... I am still organizing the pictures from the cruise. Now, I am off to an "End of the year" party. Peace out. We have been away for the last two weeks on our honeymoon (which is just an expensive word for vacation)...oh yeah, I got married last month. Anyway, we were on a cruise from New Zealand to Australia. That, of course, is the Sydney Opera House. More pictures to come as I have well over 4 GB of photos that I need to go through. Over the next few days (okay, maybe weeks) I will post some more pictures. I will also try to post a lot of the pictures on some web page somewhere. Until then...do not hold your breath. Hey look, I posted a picture...that I jacked from the internet. Here is the situation...and this just happened today. A bunch of us were going there to get a game. Back story tangent: we went to Best Buy and their computers said they they had 18 copies of the game...yet they could not locate a single copy. So, we went to Fry's. Where was I? Oh, before going to Fry's we called just to make sure they had the title. Needless to say, we were on hold, then transfered...then on hold again. The idiot on the other end never got back to us about the game. The phone call was terminated since we where in the parking lot. We walked in and headed to the video game section. Right there in the front was the game we where looking at. Uh, I do not even work there and I found it in less than 5 seconds. Great job Fry guy. 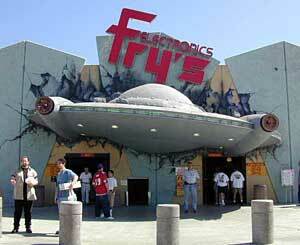 But here is my problem with Fry's. At the checkout terminal, there is a line monitor. All she (and it is usually a female) does is tell you, the next person in line, which register is open. Take a look at the picture above, go ahead I will wait. Back? Notice the green and red lights. 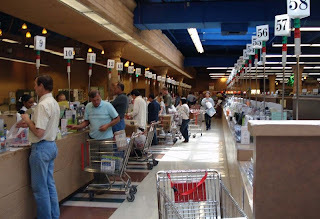 The cashier turns on the green light, then the line monitor will notify you that "register 3 is open". This is all she does. How does this justified her salary? When you apply for a job there, can you possibly be under qualified for this position?!? She could have been looking for the game we asked for!!! Then...then...oh, I am not finished. Then, after you pay you need to show your receipt to a guy at the door. It not like the door is across town, no! The receipt checker guy is twenty feet from the register. What is his job you ask? He looks at your merch and your receipt and marks the receipt with a pink highlighter. Yet another useless job, brought to you by the people at Fry's. You can also see the receipt checker guy at your local Costco. Like he/she really has time to read everything on receipt and compare it to your cart. Your membership fee put to good use there. I think I am going to start a series. It may well be a series of one. Let me start with a little introduction. I am Asian...and when I am driving my Asian Import car, that makes me an Asian Driver. So, I am an expert on the subject. I really do not care about the stereotypes of Asian drivers...actually, they are all true. With that in mind, I will give tips to other drivers. Like you, I usually give these same tips to drivers on the road as I am driving. Because we all know that the best driver on the road is yourself and everyone is stupid or crazy. Without further delay, I present you with...lane changes. First rule, LOOK BEFORE YOU CHANGE LANES!!! Signal before you make a lane change. Give at least three clicks of the signal light before making your move. Then, look again and make sure you have enough space and driver in other lane gives you the opening. Make your lane change, thank the car behind you with a simple wave. Pretty simple. There are other factors involved. When merging into another lane, do it smoothly. If I can see through your driver's side window and through your passenger window, you are doing it totally wrong. Move back two spaces, lose a turn. You should also only cross one set of lane dividers. If at any time your vehicle crosses more than one set, two things happened. You did not look, and you most likely did not signal. Lose a turn. Conversely, if it takes you more than five cars lengths to merge into the lane. You are moving way too slowly. Drivers in said lane have the right to honk at you and flip you off. You also must stay in the lane and let the car behind you pass you and give you a dirty look. Now that you know what to do, keep an eye out for other drivers that may want to merge into your lane. Hey, let them in. You can afford to be one car behind. One more thing, when you have settled into your desired lane...TURN OFF YOUR SIGNAL LIGHT!!! Remember, you may not be Asian, but there is a chance that other drivers are. We just got a new TV. That, in combination with the Wii and PS3...you may never hear from me again (not like anyone really reads this crap I write). It gets mounted tomorrow above the fireplace. I will post some pictures of that later...maybe.